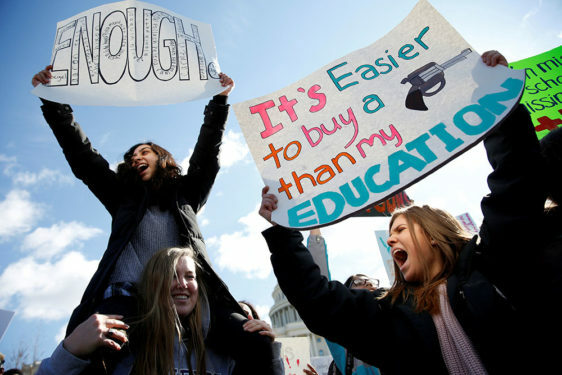 NEW YORK – While an estimated 500,000 individuals are expected to descend on Washington, D.C. on Saturday for March for Our Lives in protest of national gun violence following last month’s Parkland school massacre, students from two parishes from the Archdiocese of Chicago will be making the trek to the nation’s capitol not only to push for tighter restrictions on guns, but also as an act of racial solidarity. Father Dorantes told The Tablet that the Sunday after the Parkland shooting – which occurred on Ash Wednesday – he dedicated his homily to the subject of gun violence and the havoc it’s wreaked on both the nation and his parish’s own neighborhood. “We have been through this cycle of suffering, death, and then resurrection happening in our neighborhood, and it was a time to unite with the suffering people of Parkland through prayer,” Father Dorantes said. After Mass, two of the high school students in his parish approached him and asked what they could do to join in solidarity with the students from Florida. He told The Tablet that while they first considered doing something on a local level, they eventually decided they wanted to be a part of the national movement. What happened next, Father Dorantes said, he never could have predicted. The video was then shared on Twitter by a Parkland shooting survivor and within 24-hours the video had received 250,000 views. Soon thereafter, Father Dorantes received a phone call from his former parish – St. Clement’s -located in the more affluent neighborhood of Lincoln Park, saying they would send financial assistance. Next, he received a call from Holy Trinity Catholic Church in Georgetown saying they would cover the costs for the students’ housing in D.C.
And just when Father Dorantes was trying to process such unexpected generosity, he received a phone call from Pilar and Alexandra Peña – the two aunts of Parkland survivor Andrea Peña – saying she had seen Garcia’s video and wanted to underwrite the rest of the trip for the students. As momentum for the trip to D.C. built, Dorantes reached out to another local priest, Father Pfleger, who has been a long-time advocate for racial justice. Father Pfleger was also organizing a group from his parish to travel to Washington and they decided to join forces. The priest, in turn, invited students from Immaculate Conception to join students from his parish to meet with survivors from Parkland who traveled to Chicago last weekend for a sharing session. Father Dorantes told The Tablet that the adults tried to stay out of the conversation and let the students direct the conversation where, through tears, they traded stories of survival in an age of gun violence. Father Dorantes says he’s lost 20 young people in his parish in the last two years to gun violence, and is tired of burying the next generation and hopes this is a turning point for both Chicago and the country. Such a conviction is shared by 16-year-old Garcia, who told The Tablet that’s it’s for that very reason that he turned to his pastor for support. Father Dorantes said that many of his parishioners are immigrant families from Mexico and Central America who have lived their lives in fear and in the shadows – but he believes the events of recent weeks have emboldened them. “They see the injustices in our neighborhood that occur every day and stay quiet, but what’s been powerful is that when I talk to them I remind them that their children are U.S. citizens, they’ve grown up in this community and in this country. One of the blessings that it guarantees us is the right to free speech,” said Father Dorantes.